Unfold the pastry sheet on a lightly floured surface and roll to a roughly 10×15 rectangle. Trim off the uneven edges. Place on a parchment lined baking sheet and refrigerate for about 15 minutes. Beat the egg in a small bowl with a splash of water and set aside. 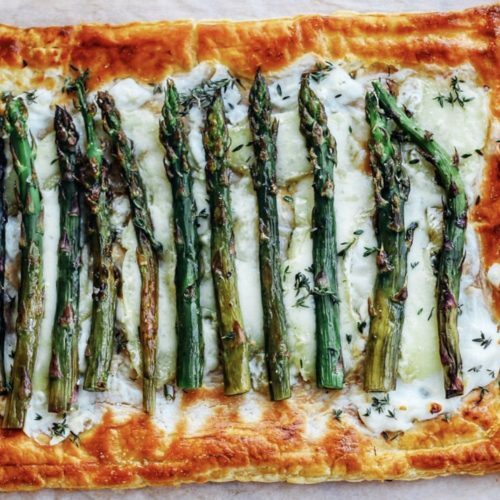 Remove puff pastry from the refrigerator and prick the center of the pastry with a fork; brush with egg wash all over (including the edges) and transfer to oven and bake for 8 minutes. In the meantime, combine goat cheese, parmesan, ½ tablespoon olive oil, salt + pepper in a small bowl and mix until creamy and smooth. Trim tough ends off of asparagus and season with remaining olive oil, lemon zest, fresh herbs and salt + pepper. Remove puff pastry from the oven and gently push down. Spread goat cheese mixture on crust. 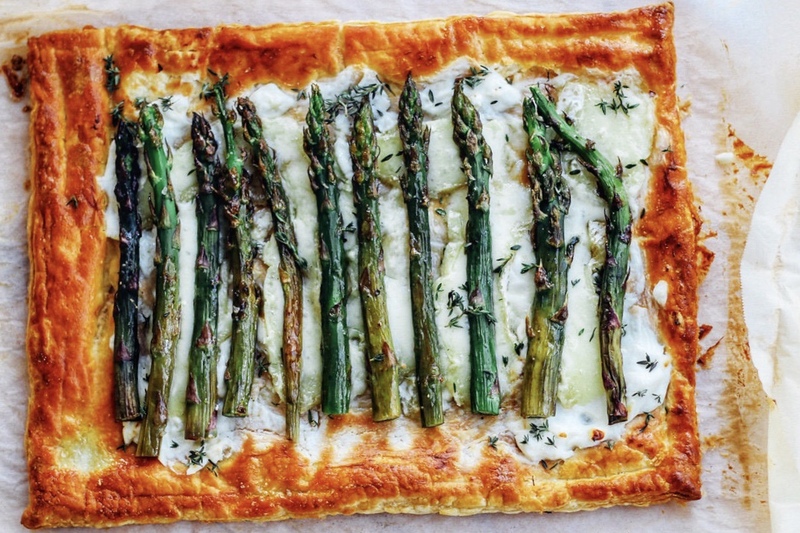 Place brie slices on top and lay a single layer of asparagus over the brie. Return to the oven and bake an additional 10 minutes until pastry is golden and puffy.